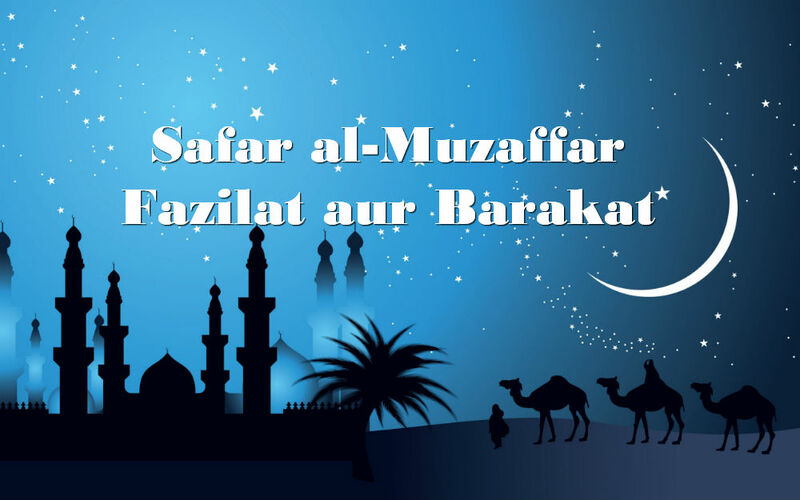 Safar al-Muzaffar is the second month of the Islamic calendar. Literal meaning of Safar is empty. During this month the houses used to be empty and deserted because the ban on going to war in the month of Muharram came to an end and everyone proceeded towards the battlefield. Safar also means to be yellow. When the names of the months were being given it was the season of autumn and the leaves of the trees were yellow. Many people have erroneous beliefs regarding this month i.e. it is a month of misfortune and calamities. The teachings of Allah Ta'ala and His Most Beloved Rasool (SallAllahu Alaihi wa Sallam) gives us clear guidelines on such incorrect beliefs. Today too, there are some Muslims who hold incorrect beliefs regarding the month of Safar. 1. A nikah performed in this month would not be successful. 2. This month is full of misfortune and calamities. 3. To commence any important venture, business etc. during this month will bring bad luck. 4. The first to the thirteenth of Safar is ill-fortune and evil. 5. The person who distributes food or money on the 13th of Safar will be saved from its ill-fortune. 6. To celebrate the last Wednesday of Safar and regard it as a holiday. The above Ahadith clearly refutes all incorrect beliefs and superstitions regarding the month of Safar. These incorrect beliefs flow from the pre-Islamic period of Jahiliyyah . 1. To shun all types of erroneous beliefs regarding the blessed month of Safar. 2. To understand that the most unfortunate person is he who disobeys Allah Ta'ala's commandments e.g. does not perform the five daily salaah etc. It is narrated in a hadith that Rasoolullah (SallAllaho Alaihi wa Sallam) said: "Pray, 0 Allah! Cause not anyone of us to be a wretched destitute." He then asked: "Do you know who is a wretched destitute?" Upon the request of the Sahabah (Radi Allahu Ta'ala Anhum) he replied, "A wretched destitute is he who neglects his salaat." 3. We should understand that all conditions which befalls us, good or bad, favourable, or unfavourable are from Allah Ta'ala, (as a result of our actions). Allah Ta'ala says: " Whatever misfortune befalls you, it is due to the things your hands have wrought, and He forgives many a sin." (Surah 42 - Verse 30). Sayyadina Jabir (Radi Allahu Ta'ala Anhu) has said that, "I have heard Sayyadina Rasoolullah (SallAllaho Alaihi wa Sallam) saying, the descending of illness and evil superstition befalling in the month of Safar is untrue."